There are two types of cards – treasure and encounters. Each turn the current players ‘kicks down the door’ – drawing an encounter card from the deck. Usually this will involve battling a monster. 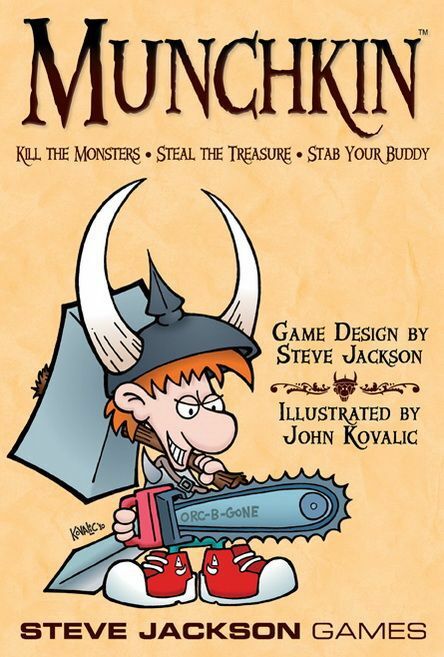 Monsters have their own levels and players must try and overcome it using the levels, weapons and powers they have acquired during the game or run away. Other players can chose to help the player or hinder by adding extra monsters to the encounter. Defeating a monster will usually result in drawing treasure cards and acquiring levels. Being defeated by a monster results in "bad stuff" which usually involves losing levels and treasure. Munchkin Weihnachtsedition – The same as Munchkin, but with a promotional button that grants the wearer extra treasure (when worn in December).